When I first moved to Portland, several years ago, one of the things I really wanted to do was visit Mt. St. Helens. Growing up in the Midwest, I could hardly have imagine someday living in the shadow of a volcano...let alone one that was active! On the way up to the viewpoint, I kept noticing stands of intensely colored magenta flowers. What were they?!? I had never seen anthing quite like them. They weren't single and solid-looking as Foxglove...they seemed more diaphenous...and were clumping...not single stalks. Of course, during that time, I was still looking for a job, so my obsession with these mystery plants was short-lived. Every time I'd venture out into the area outside of Portland, however, I'd see these flowers, again and again...taunting me! 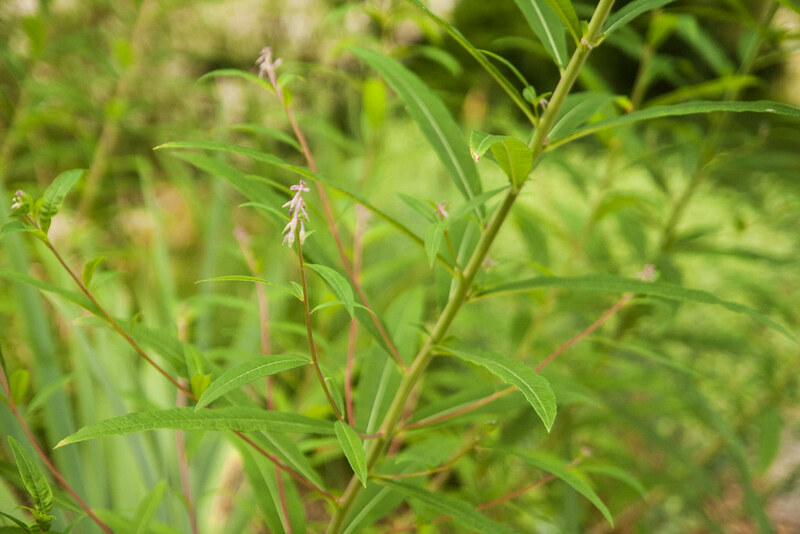 Finally, I started looking in earnest, and soon discovered that these must be Epilobium angustifolium, more commonly known as Fireweed (or, in England, Rosebay Willowherb). Named due to the fact that they are typically one of the first plants to re-appear after a fire or other natural disaster. In fact, they were one of the very first plants to emerge on the scarred and blasted hills and valleys around Mt. St. Helens. 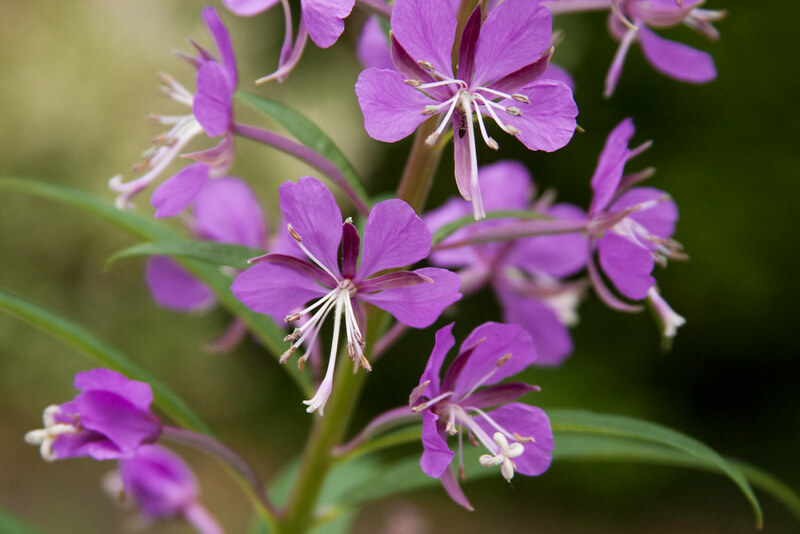 Strangely, no one around the Portland area seemed to sell Epilobium. It seemed strange...here was a beautiful native plant, that was completely ignored by nurseries! It seemed odd that while I kept seeing native plants of dubious merits (drab) for sale all over, this colorful (and apparently easy-going) plant was no where to be found. Perhaps it was horribly invasive in a garden setting? Eventually, however, I found some last year at Bosky Dell Natives...which, if you're looking for natives, this is the place to go. I bought 3 tiny little plants...barely more than a few wispy twigs with a crown of needle-like leaves, and popped them in the ground. Then we got our first freeze. I hoped they would be ok...but wainted nervously as spring arrived and there was no sign of them. I needn't have worried...they popped up as soon as the days grew longer and grew with lightning speed! Last month, they started forming flower buds, which gradually elongated and a few weeks ago, they started blooming...and what a show! Spike just before blooming Blooms! The flowers are exactly what I remembered falling in love with...such bright, saturated color...but not garish or overwhelming. Indeed...they could almost be called subtle in comparison to most flowers you see for sale in nurseries. If not for their size, they could easily be overlooked. I find them as stately and lovely as Delphiniums, without the need for staking (although mine do tend to LEAN outward a bit). Something I never realized while observing them in the wild is the branching along the main stem, which would seem to create even more bloom spikes...extending the show for even longer. The height for mine is topping out around 5.5-6', but I've seen them around town at least 7' tall (maybe even taller). Those remind me a bit of lupines too, which are also among the first to come back. We planted lupines to try to feed some nitrogen back into our horrible soil - do you know if these would do the same? 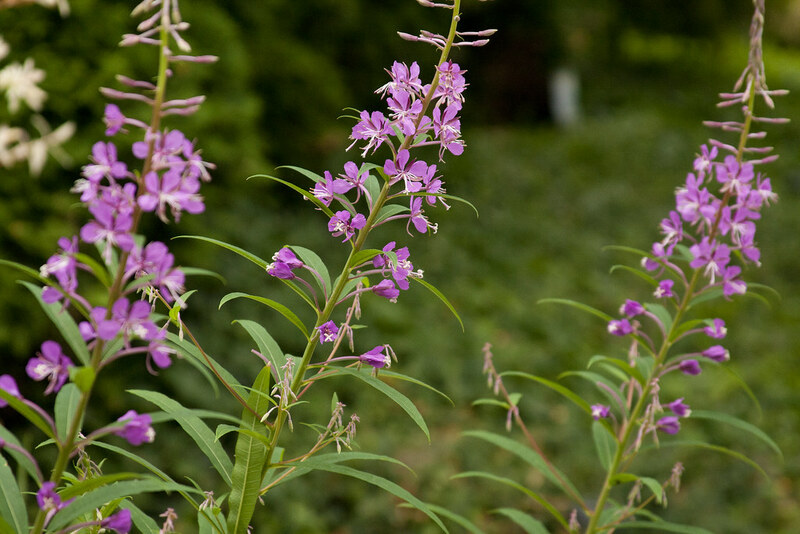 Fireweed was flowering everywhere about 6 or 7 years ago, when I came to Washington for the first time and realized it was where I wanted to live eventually. It's flowering all over the roadsides right now. 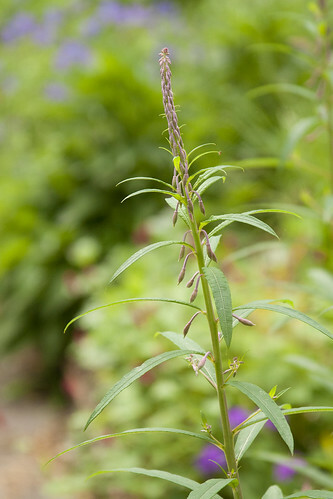 I've been wary of planting it in my garden, though, because I have also heard it can be aggressive. I hope it behaves for you. There is a clump of this awesome plant along the roadside right outside of town. I pass it every time I venture out. I LOVE it. I want to grow it but don't have any available space. Please let us know how it behaves for you. Your photos are awesome. Great photos! And a really interesting plant! I remember seeing the plant near the Grand Tetons. great post - and as always your photography is super - the flowers remind me of phlox - 6 ft tall - i guess that makes a statement in the yard. 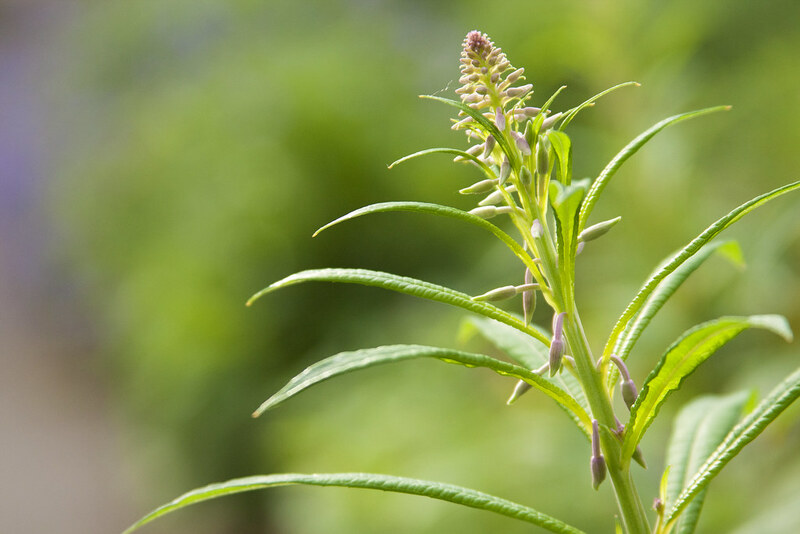 It's edible too (google celtnet rosebay willowherb recipes if you're feeling adventurous). If you want to stay friends with your neighbours you may wan to deadhead before the seedpods open and send out their 1000's of fluffy seeds on the wind (they travel miles and germinate in all manner of places). 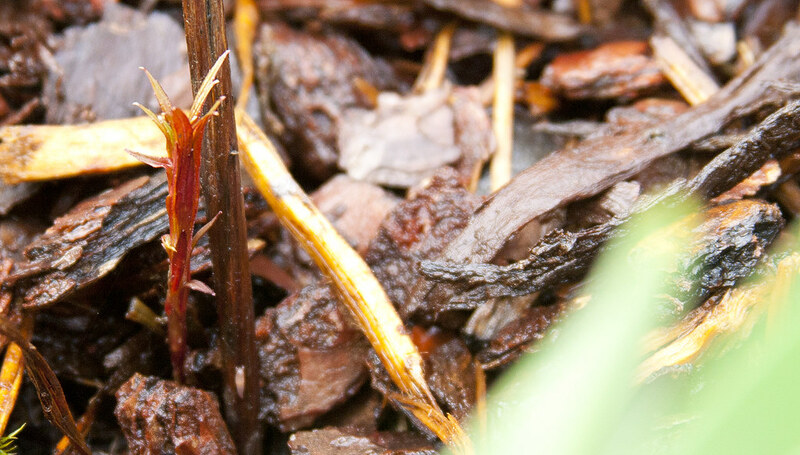 As long as you clear any advancing rhizomes it's possible to make it behave, though it will want to take over if it likes your soil. I maintain a lovely clump out back. The white variety is better behaved and less inclined to out-compete the other plants, though the pink one really is so stunning. Thanks for sharing your photo's of this beautiful plant. I found one plant growing in my back garden and removed it. 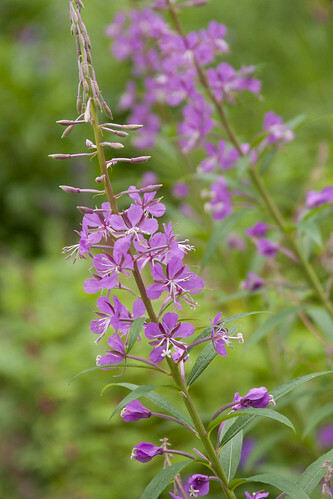 I was also informed that Fireweed is a carrier of blight and rust. Be careful.......but great photographs! It's beautiful.... I love the color. It's gorgeous, but hopefully it does not take over your yard. Natives can be pretty invasive--it's their territory, after all. I like this native plant in France also. I introduced it in the garden for the natural side. It sows almost everywhere but it is enough to extract them simply ! Did you see in my last message " angustifolium album " ? 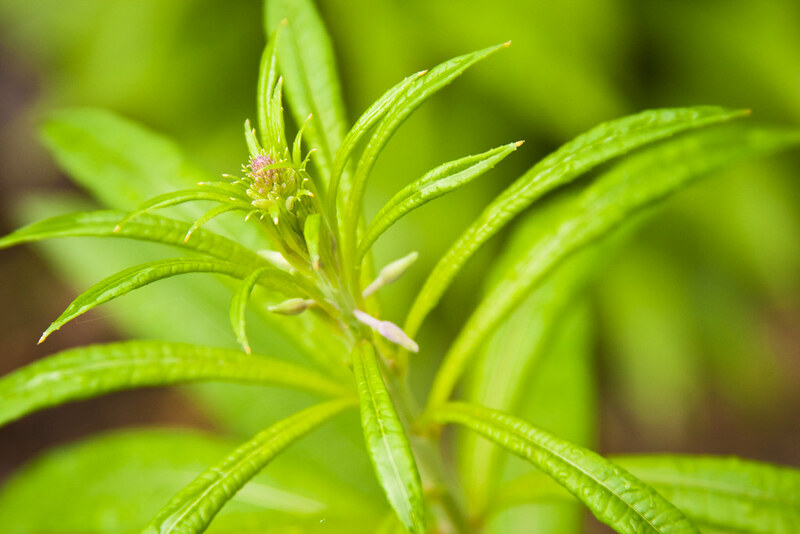 Chrissie: That's very true about Lupines…I don't think Epilobium is a legume, however…while researching your question, I found a study where some compound it produces was found to inhibit cancer cell growth…how cool! Sunray Gardens: Totally…it's so strange to go somewhere and all the roadside flowers are different! Alison: I'm definitely keeping an eye on it…keep your figures crossed for me! Grace: Aren't those big clumps stunning…like a shot in the arm of happiness! Wife, Mother, Gardener: Thanks so much, glad you liked it! Greggo: Cool…I bet it was beautiful there…those are amazing mountains! David: Hahaha…indeed! I do have a thing for tall plants! Cally: How cool! It's good to know that in a pinch, I could make a meal of them…hahahahaha! Very good advice about the seeds…I'll have to be diligent about those…no one likes a pest! Beech Street Gardens: Good to know about the hosting blight and rust…I'll have to keep an eye out for those…haven't had trouble with them in the past, so if it starts getting out of hand, I'll know who the culprit is! Sweetbay: Isn't it lovely…so charming! Hoover Boo: Hahahaha…indeed…I'll keep watch over it…no thugs allowed! 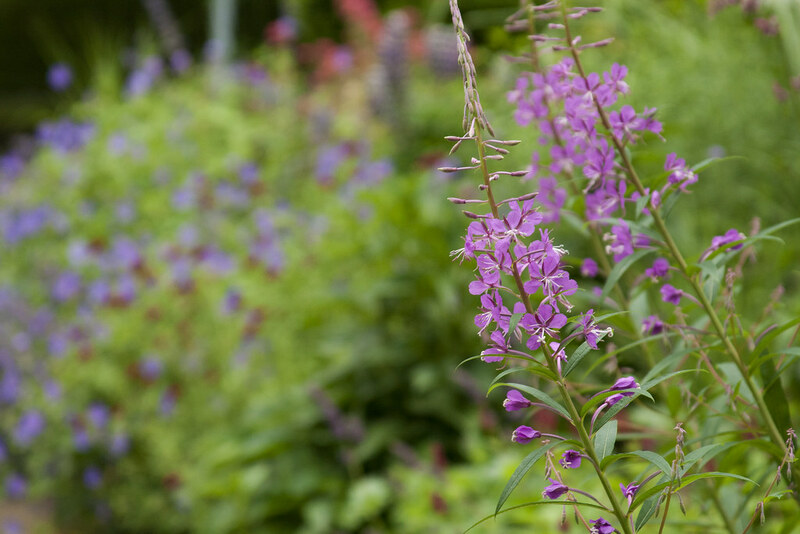 Adiante: I bet your natural plantings are just amazing…do you have photos of them somewhere…I'd love to see them! 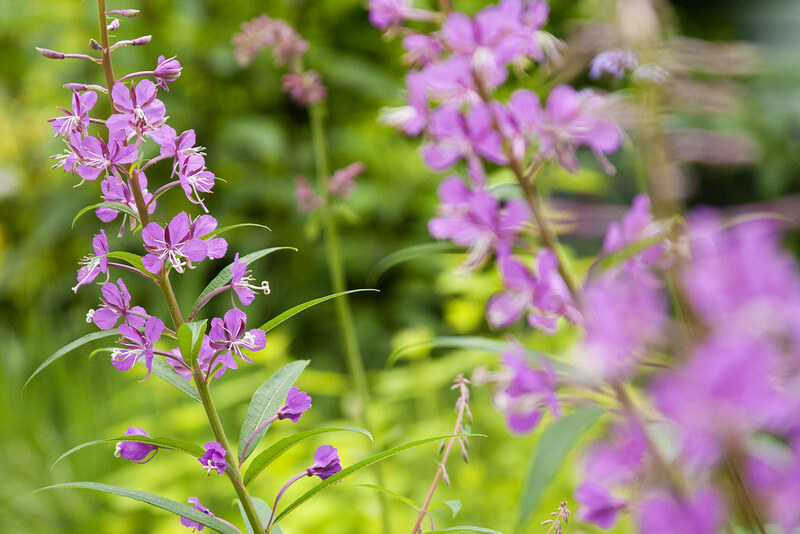 I've admire the fireweed when in bloom along the road here in the PNW. Have it along my gravel driveway & pull it when it's done blooming because it's raggedly looking. Always enough seed sown that it's back the next year. The Next Generation of Astrantias?